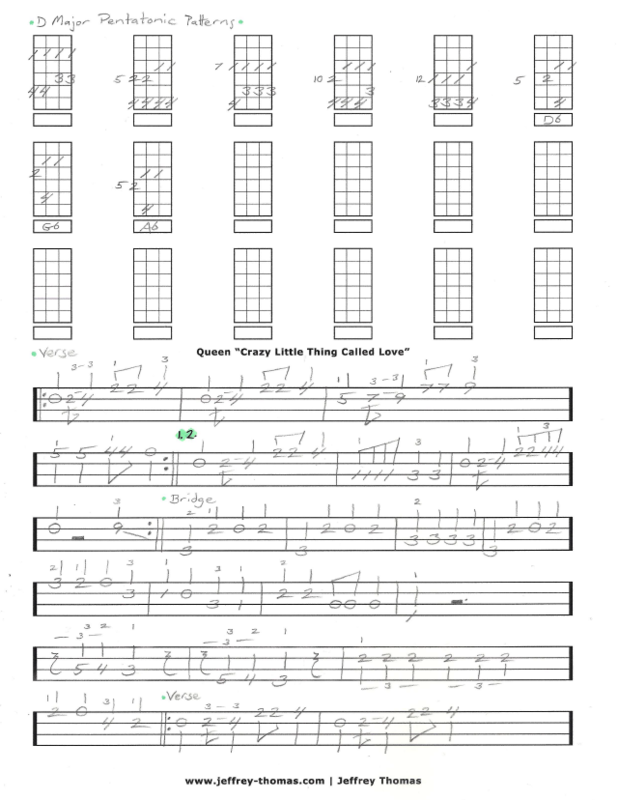 Crazy Little Thing Called Love Free Bass Tab by Jeffrey Thomas. I have the complete song written following the studio version of the classic tune. Learn the verses, bridge, bass line behind the guitar solo and all five D Major pentatonic patterns. This tune is very popular with my bass students. Want the full bass tab for free? Just send in your email address using the form provided. Looking for the best online bass lessons? Fill out the Schedule A Free Lesson form to set up your free Skype bass lesson today. This song became Queen’s first number one single on the Billboard Hot 100 chart in 1980. Make sure to check my Bass Tab Archives and Bass Video Archives for more bass tabs, video lessons, tips and tricks.